Healthy Eating Basics – Focus on whole fruits, eat a variety of vegetables, choose whole grain, choose low-fat, eat a variety of proteins. Bye-Bye, Couch Potato! If the winter weather prevents you from getting outside, don’t just reach for the remote. Make your time inside count. There are many ways to get physical activity indoors—no gym required. Hand weights or resistance bands are a great addition, but not necessary. You can also wear a heavy backpack to add intensity to your workout. Realistic resolutions, really great year! You’ve got this. Ready to be your healthiest, happiest you? Just skip the long list of resolutions and go for a few realistic ones that stick. So you’ll shine, not stress. Don’t share your cold this holiday season! December is a busy time for most people. Between the rush of the holidays, the end-of-the-year excitement, it’s easy to become run down and exhausted—perfect conditions for illness to take hold. When your system is run down, it’s extra important to stay healthy by avoiding germs, and the best way to do that is by washing your hands. 10 Steps to staying healthy this Holiday season. 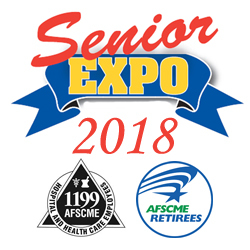 The Retiree Division of District 1199C is pleased to invite you to a Senior Expo and luncheon on Thursday, October 25, 2018. This event will be help at the Courtyard Marriott Hotel in City Line Avenue at Monument Road in Philadelphia. We are excited to present this event, which will combine displays by vendors whose products and services are of specific interest and benefit to us seniors. This is the Expo part of the events on October 25. Vendors will be available to you between the hours of 10 a.m. and 4 p.m.
We hope you will come out and spend some time with our vendors and gain insight into products and services which will be of specific interest to you. We have invited speakers on a variety of topics, from politics – this is an election year, after all – to financial advise for seniors. The program will start at 11:00 and will be followed by a delicious buffet luncheon scheduled for 1:00 p.m.
Best of all, there is no cost to you! We very much hope that you’ll come out and join us on October 25th. Please let us know you’ll be coming by calling the Benefit Fund office at (215)735-5720 or 1 (800) 531-1199 if you’re outside the (215) calling area. We very much look forward to seeing you on October 25th! cholesterol can block the flow of blood to the heart or brain. August is National Immunization Month! Did you know you need vaccines throughout your life? Even if you were fully vaccinated as a child, the protection from some vaccines you received can wear off over time and you may need a booster.